Good posture: Get back to basics. 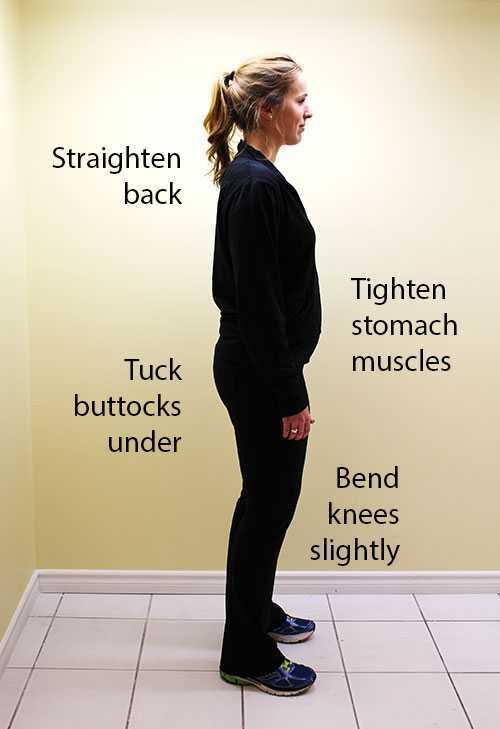 Creating and maintaining good posture decreases you risk for back problems. Achieving comfortable, good posture will provide a functional range of movement that will allow you to perform daily activities safely. There are several key steps in creating proper balance and alignment of the back. The spine should be straight with your body weight balanced over your legs and centred between your feet. Tightening the stomach muscles while slightly bending the knees, and tucking under the buttocks all work together to straighten the lower spine. These activities together remove pressure and strain from the lower back. Relaxing and rolling the shoulders back over the pelvis stabilizes upper body weight. Keeping your ears back, over your shoulders, balances the head and relieves strain in your neck. Disciplining yourself to maintain good posture will be rewarded with a lifetime of comfort and reduced stress on the many complex structures of the back. Sleeping and resting on your side with bent knees, and a pillow between your knees, or on your back with knees supported on a pillow provides the least strain to your resting back. Sleep on a firm mattress with good support. Avoid poorly supported resting postures. Sitting puts more stress on the back than standing, especially when slouching. Slouching forward at the shoulders reduces flexibility in the back and strains the neck. Keep a good posture daily. Taking care of your back is one of the most important activities you must include in your daily routine. With knowledge of your anatomy, good posture, and strong muscular support you will now move wisely throughout each day. Remember to keep your back’s natural curves aligned, balanced, and well supported. By moving your back as a unit, you avoid bending and twisting motions that put stress on your discs. When lifting, hold and carry objects close to your body’s center of gravity to enable you to balance and use your arm and leg muscles. To relieve pressure on the lower back while standing, raise one foot or the other. Also, slightly bending your knees enables the pelvis to tilt and decrease dangerous stress on the lower back. Good posture is a full-time job. The exercises that give you the basic training and skills to move safely must be applied to everyday living, throughout each day. Heavy lifting should use the work of your legs and not the back. Bend through your hips and knees. Keep the weight close to your body to reduce stress on the back. Picking up small objects with a golfer’s lift with a straight back uses movement at the hip and a straight spin. Sitting straight with good lumbar support and knees level with the hips is least stressful. Never push and pull a vacuum, shovel, or a shopping cart with a bent back. Carry a tool box, suitcase, or briefcase with straight, balanced posture.